For maintaining critical product purity or for safe transport of highly corrosive acids, you can depend on OMEGA's all-PVDF flow monitoring systems. Known for its superior heat-resistance and thermal stability, PVDF is quickly becoming the preferred piping material in many ultra-pure water and acid transport applications. Using no dyes or stabilizers, OMEGA offers the only "pure" PVDF flow-monitoring system. Available for installation in pipe sizes ranging from ½ to 8", this system is easy both to install and maintain. Combine OMEGA's PVDF flow monitoring system with your existing PVDF pipe including SYGEF, PVDF, and SUPER PROLINE. This all-PVDF system completely eliminates the possibility of contaminated fluid product, making it perfect for measuring D.I. water in cosmetic, food, and pharmaceutical production. In addition, processes utilizing D.I. water in the semiconductor industry can be monitored with total confidence. When pumping hydrofluoric acid to wafer etching tanks...processing sulfuric acid through water treatment skid for regeneration...or transporting harsh solvents, OMEGA's PVDF flow monitoring systems provide rugged, corrosion-resistant construction. 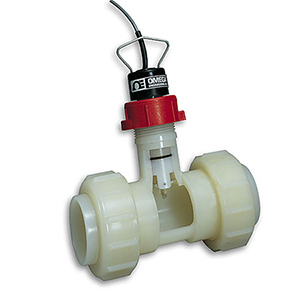 PVDF Sensor installation Tee fittings allow direct compatibility with SYGEF piping, joined by the fusion using special electro heating elements. The socket fusion process combines simple handling with high operational safety and reliability. When used in PVDF or SUPER PROLINE piping systems, a flange connection is recommended. OMEGA’s PVDF Flow Sensor includes the same design features as our standard FP-5300 Sensor, with a ±0.2 fps accuracy and ±0.5 fps repeatability.